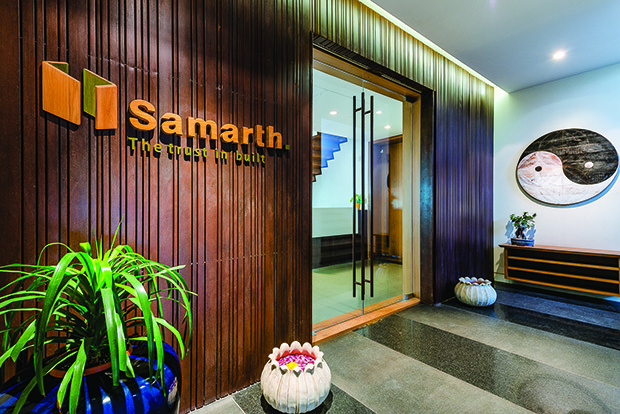 The leitmotif of hollow C-profile slats of varying widths that runs through Samarth’s office, makes its first appearance as the facade of the entrance. 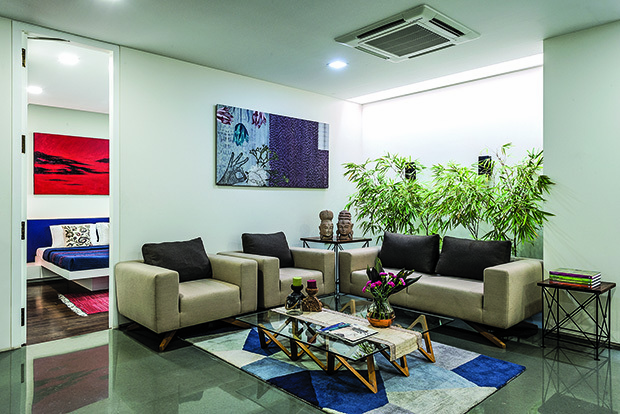 While homes often weave facets of the owner’s personality and lifestyle into the design scheme and thrive on emotional connect, commercial spaces are driven by more pecuniary considerations: budgets, deadlines, and the like. 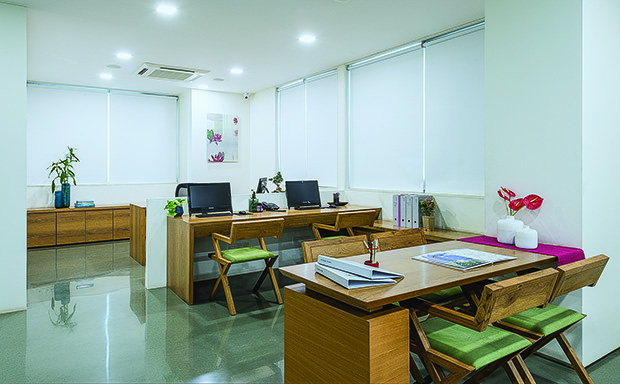 But the design direction of this commercial space (an office in Surat) was equally determined by the promoter’s taste, preferences and personality, and the economic aspects associated with such an exercise. 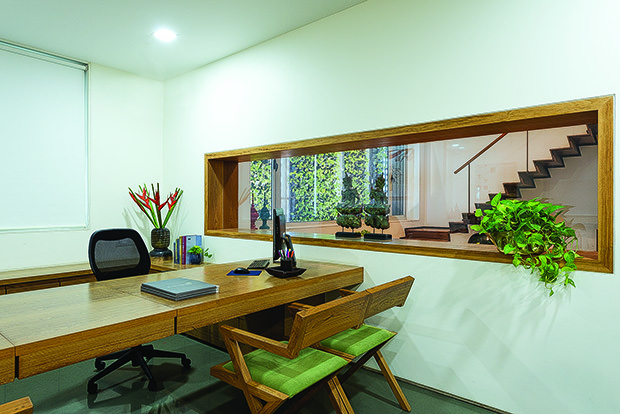 The owner of the company — a real estate developer — was clear about what he sought from his workspace: a main (owner) cabin that had to have a formal area and an informal lounge; connections between levels; links between inside and outside; and integration of greenery into the internal environment. As the office was to be created in a building developed by the firm, there was freedom and control over the internal configuration of the penthouse level where it is located. 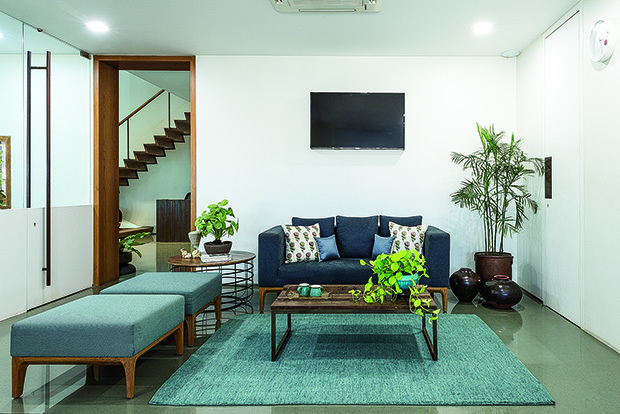 Therefore, the architect — Hardik Shah of Surat-based Studio Lagom — viewed the space as a plot, and sketched out a double-height reception that would connect both levels, and an owner’s cabin that spilled over into a partially double-heighted west-facing terrace with beautiful sunsets. “Within the remaining space, on the lower level, was created an essentially open-plan office, with the requisite cabins, especially one reserved for the accountant/manager — a sensitive post, considering the compact size of the staff — overlooking the reception, the main entrance and the general office area. 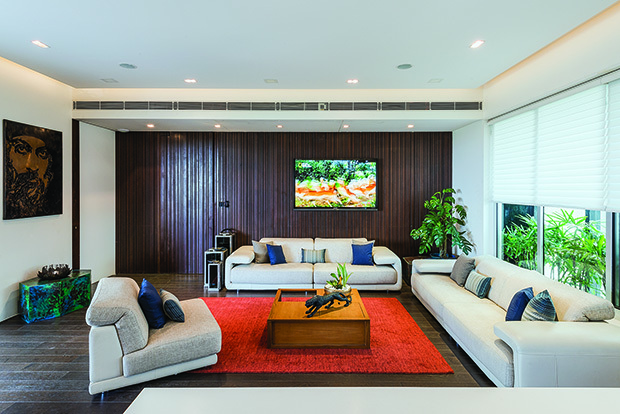 On the upper level, is a suite of rooms that function as a guesthouse,” informs Hardik. he top shot of the reception shows the neat arrangement of all requisites connected to this area. The MS staircase cascades down from the upper level and culminates into a waterbody, which, together with the vertical garden nestling within the duct, establishes a connection with nature. The architect chose an unostentatious and demure material and colour palette which refers to the simple and humble personality of the owner — timber and veneer, weathered steel and mirror-polished grey kota and cudappah stones (both varieties of limestone) teamed with pastel soft furnishings. The entrance facade presents solidity through its use of hollow C-sections of mild steel of varying widths. The material spills into the reception lounge via the reception desk and the staircase that climbs to the next level. 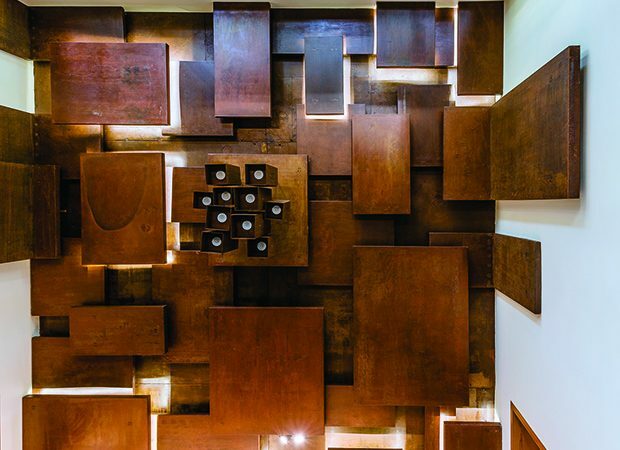 It is rendered as a one-fold metal plate entity, overlaid with wood for a carpet-like effect. At its base, is a waterbody whose gentle susurration imbues the space with serenity. 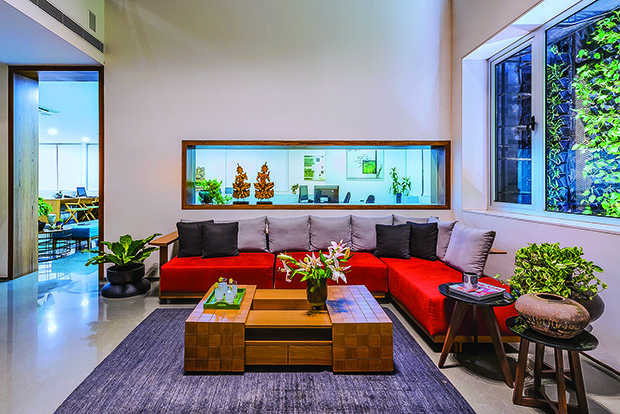 The reception lounge sees a strong interpretation of the inside-outside connect with its 24’ vertical garden accommodated in a building duct. The greenery presents a strong counterpoint to the metal of the desk and stairs, creating a taut balance between the animate and inanimate; the organic and the inorganic. The motif of the random bands (seen first in the entrance facade) is repeated as grey metal lattices that punctuate the green wall. Besides the lush vertical garden, another design highlight of the double-height reception is the customized chandelier that uses the ceiling and part of the wall as its canvas. The installation, which features an overlapping collage of weathered steel quadrangles of varying dimensions and heights, conceals light fittings in its components for added effect. The lounge-like, sunlight-drenched terrace of the master cabin offers a welcome break from arduous work schedules. The MS slats work as a screen that erases the neighbouring structures from sight and, as a shorter version, function as a railing for this double-height space. The cudappah on the floor climbs up the wall to create butchwork-like cladding with a koi pond at the base. Up the stairs is the dining space of this area. The master cabin, which was elevated as a token of respect to the position of the occupant, brings together an eclectic material palette of engineered wood, mild steel and Corian. 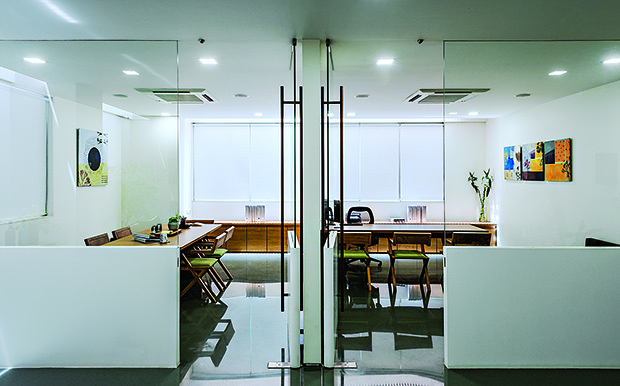 The entry door is cleverly concealed within a wall lined with the lietmotif of MS sections. A counterpoint to the metal is an internal garden — the link between the inside-outside again — that basks in the natural light from the skylight. 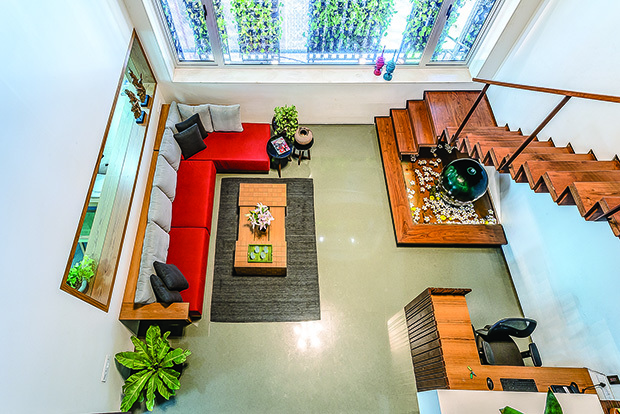 The cabin spills over into the terrace, a lounge-like break-out space revelling in sunlight and greenery. 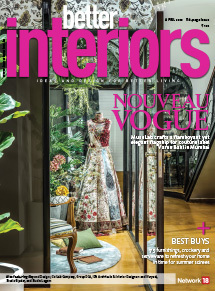 “Here, MS slats work as a screen that visually ‘erases’ the unsightly neighbouring structures and, as a shorter version, function as a railing for the double-height space,” says Hardik. The cudappah on the floor climbs up the wall to create butchwork-like cladding, with a cascade and a koi pond at the base. Up the stairs is a formal meeting room, a cocoon-like space wrapped in black leather-finish cudappah and black paint. One large 40’ x 10’ wall has been turned into a canvas for a silhouette of a sylvan setting. This, along with greenery, animates the closed area, and adds visual depth. Housed on the upper level, the executive staff area comprises an informal seating lounge, guest room and conference room. This functions as a guesthouse for visiting consultants, and is also pressed into service for presentations and for recouping energies between long-drawn meetings. Soothing and serene, its simple elegance is heightened by greenery that is bathed in sunlight that pours in through several skylights. 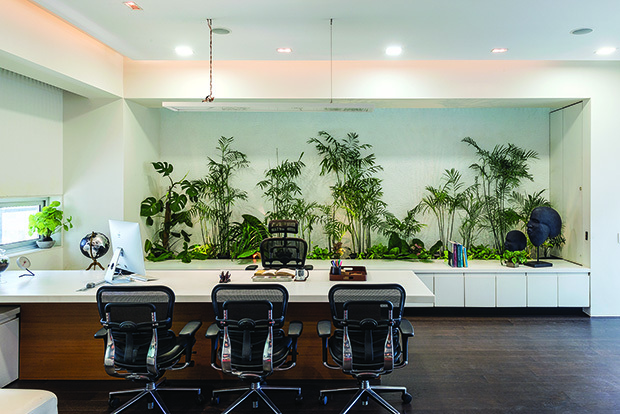 This office eschews from chest-thumping, pretentious design statements, and relies on simplicity, comfort and nature to create an effective workspace. To create a simple, effective workspace that would have meaningful vertical connections and links between the inside and outside. 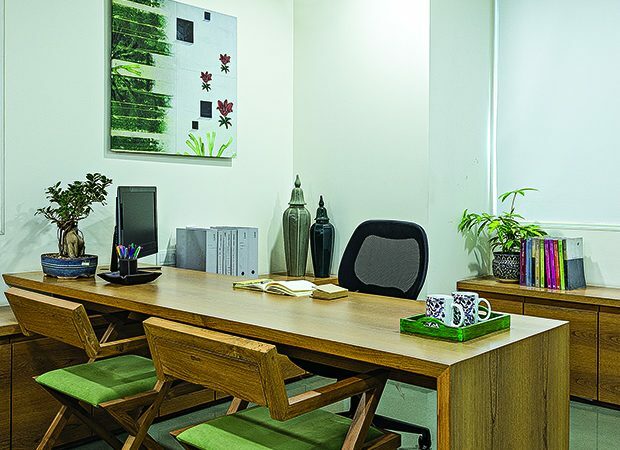 The main reception area is visually connected with the accountant’s cabin as he needs to keep his finger on the pulse of the office. On the ceiling, an overlapping collage of MS rectangles and squares — some of which also climb partially down the walls — creates an intriguing chandelier. In addition to direct spotlights, the geometrical elements conceal lights for indirect illumination. The waiting lounge of the open-plan office. Subtle textures and soothing colours create a serene, welcoming picture. 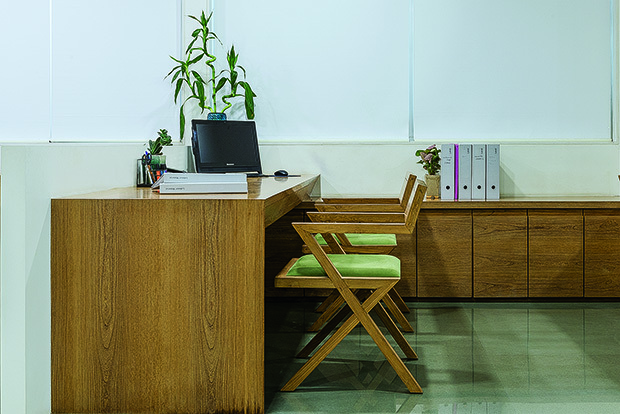 At the work area simple, geometric profiles of the furniture create a setting that is light on the eyes and allows plenty of breathing space. The work area on the ground floor. The main (accountant’s) cabin on the lower level. A long, slit-like wood-framed window allows him to keep a tab on daily activities. 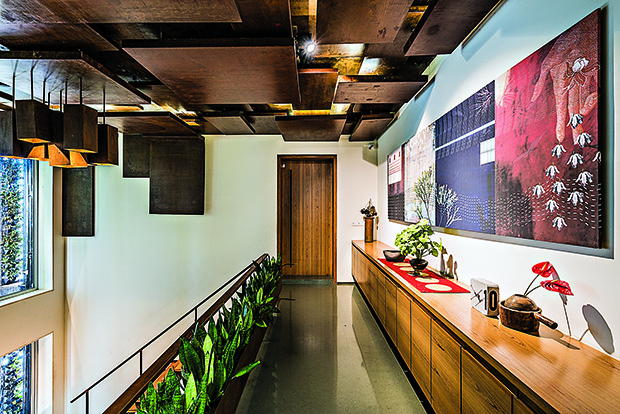 In the owner’s cabin, the warm chocolate of the engineered wood floor is carried forward by the MS slatted wall — which also conceals the entry door. Mild steel also makes an appearance as an angular blue-green distressed table. The owner’s cabin, again. A counterpoint to the mild steel wall across is the internal garden (behind the desk) that basks in natural light from the skylight. The desk and the floating storage are made of Corian. 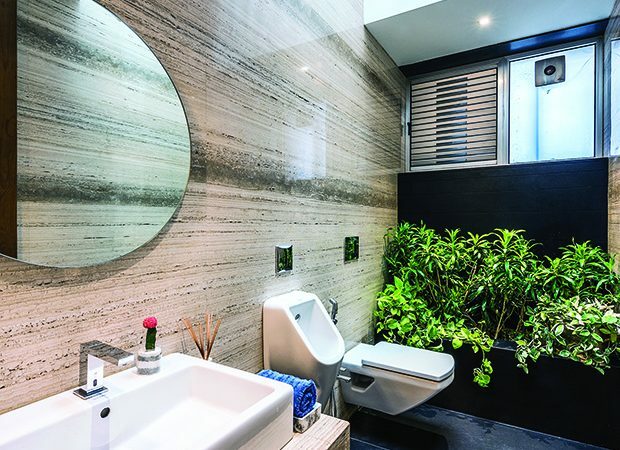 In the owner’s washroom the travertine of the walls and the black limestone of the floor make a striking combination. The skylight and the greenery are seen here, too. This bridge connects the executive staff area and the upper-level terrace (with a formal meeting room) of the owner’s cabin. The MS chandelier can be seen clearly here. The lounge of the ‘guesthouse’ above invites you to relax for a while. The bedroom can be glimpsed through the partially open door. The executive staff area of the guesthouse. These rooms are pressed into service for long-drawn meetings and presentations. 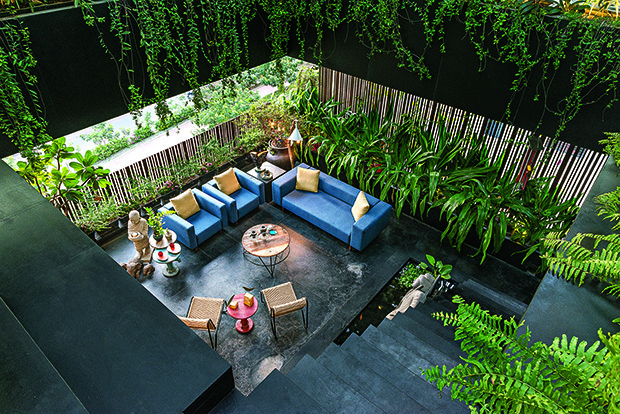 The top view of the lounge, from a creeper-lined cutout that visually connects both the levels of the terrace. 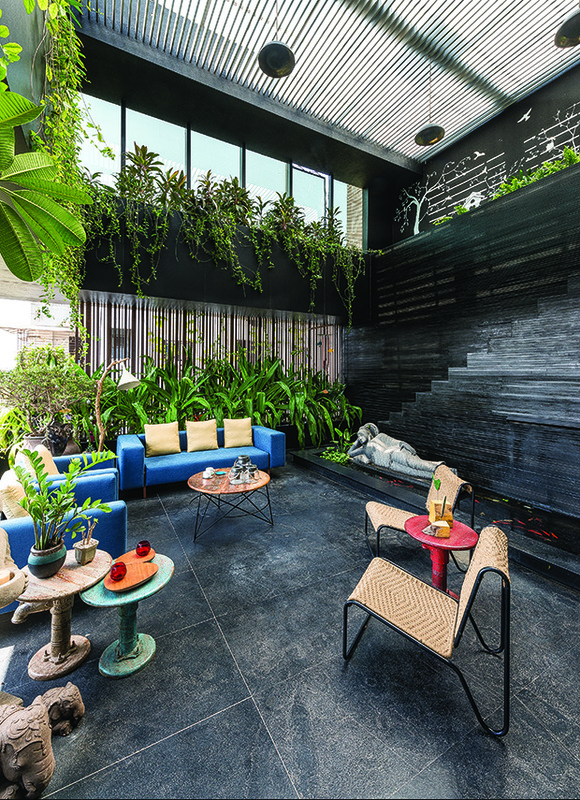 The dining area of Samarth’s master cabin terrace is a cocoon-like space wrapped in black leather-finish granite and black paint. 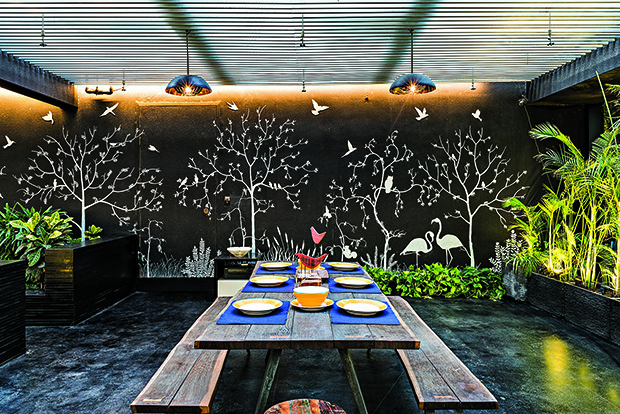 The large 40’ x 10’ wall turns into a canvas for a silhouette of a sylvan setting, handpainted by Kruti Sheta-Patel. This, along with greenery, alleviates the sombreness of the dark hue.